Labour’s elections supremo has stepped down after a career of nearly 20 years working with leaders from Tony Blair to Jeremy Corbyn. Patrick Heneghan revealed the move yesterday and said it was the “hardest decision of my life”. Hardest decision of my life to leave the Labour Party. I wish everyone at @UKLabour all the best for future. It’s been amazing. 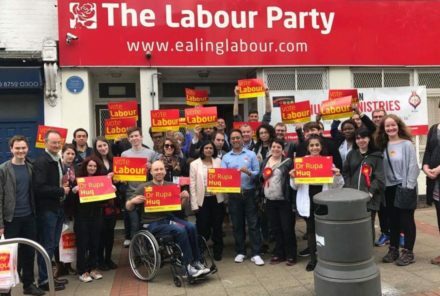 The announcement of his departure, three months after the general election, comes as Labour wins plaudits for its campaigning performance but undergoes an internal debate over whether its strategy was too “defensive” during the short campaign. Heneghan, executive director for elections, was a respected figure among Labour staff having worked under Blair, Gordon Brown, Ed Miliband and Corbyn. His exit raises the prospect that Corbyn could step up efforts to install more political allies at Labour headquarters in Victoria Street in London. A series of experienced figures have also left the party’s press office since Corbyn first took the leadership – although staffers point out that there is some churn among aides after every general election. Yesterday Heneghan won praise from a series of senior Labour MPs including shadow health secretary Jon Ashworth and Lucy Powell. “Patrick Heneghan leaving is huge loss to Labour as an election machine. He’s the best at what he does & can be proud of his achievements”, Ashworth wrote on Twitter. Heneghan said it had been a “privilege” to work for the party, according to his memo to staff, which was published by the Huffington Post. “I’m proud of the team I’ve built, the 50 of you here now in HQ and the hundreds that have worked in our field campaigns in the unending elections, referendums and by-elections. We pioneered the use of national data-led analytics and marketing to drive local campaign operations in 2008, we targeted and saved the seats that denied the Tories a majority in 2010, delivered the 2014 Scottish referendum, survived the heart-breaking 2015 election and EU referendum result in 2016 and delivered beyond all expectations this year. “I was especially proud of the advances we made in our digital campaigning; building new technology and integrating digital campaigning into the centre of the campaign. With a fraction of the resources of the Tories we built a campaigning machine that is the envy of all the other political parties.